Secure and showcase your hunting supplies without sacrificing valuable space with this attractive Rustic Log 2 Bow and 12 Arrow Wall Rack with Storage from Rush Creek Creations. This beautiful, solid pine rack secures and displays 2 bows and up to 12 arrows on an attractive wall rack with a sturdy rectangular design that enhances the aesthetics and visual appeal of any room. The wood is given two varnish treatments composed of a skip-peel finish and a polyurethane treatment to protect both the rack and your equipment from scratches or dents without compromising the classic cabin style. Heavy-duty mounting hardware is included to ensure the rack stays firmly in place on the wall of your cabin, mudroom, shed, garage, or anywhere you store and display your collection. A special boring tool was used to enable easy placement of arrows on the rack and extra long pegs are included to securely hold the bows. The base of the rack also features an extra-wide storage drawer to hold any other accessories, keeping all of your equipment in one secure spot. Extremely durable yet lightweight, this rack makes the ideal solution for storing and showcasing compound bows and arrows. 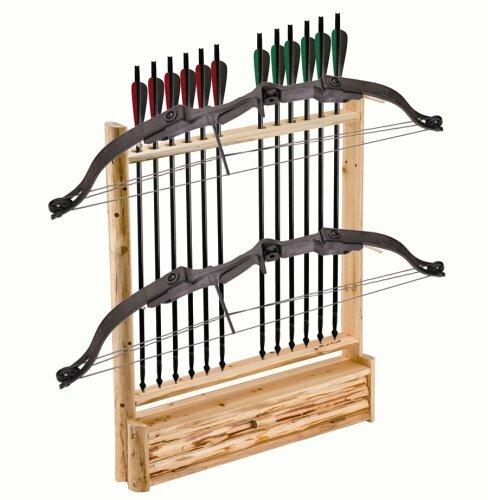 With its rustic charm and sturdy design, the Rush Creek Creations Rustic Log 2 Bow and 12 Arrow Wall Rack with Storage is an essential item for any sportsman and hunting enthusiast. Includes 1 rack. Bows and arrows sold separately. If you have any questions about this product by Rush Creek Creations, contact us by completing and submitting the form below. If you are looking for a specif part number, please include it with your message. Magnetic Gun Mount & Holster To Conceal -Tested To 35lbs! w/ Rubber Coated Durability, Firearm Accessory , Holder for Revolver, Rifle, Shotgun, Pistol, Handgun, Mounts To Truck, Car, Boat & Home!